It's a simple solution to a grim problem: the top 1% of income earners often pay less tax than we do. A 'Buffett Rule' would introduce a minimum effective tax rate to stop the 1% from making excessive use of deductions and loopholes. It's a simple rule, it's very popular, and it'll raise billions of dollars – but our political leaders haven't heard about it. That's why we created this infographic that's easy to understand and hard to ignore. In the lead up to the ALP National Conference, where the Labor Party will debate what tax policy they'll take to the Federal Election, GetUp members are delivering the facts to their ALP representatives. Together, we can make the Buffett Rule the 'water cooler' conversation at this year's conference. Will you send your Labor MP or senator this eye-grabbing infographic – then share it with all your friends? Wait, what's the Buffett Rule again? Thanks to tax loopholes and high priced accountants, Kerry Packer famously reduced his effective tax rate so he paid less tax than his gardener. "The Buffet Rule" would put provide a catch-all for tax loopholes used by high income earners. The proposed policy would see the wealthiest 1% of Australians, who earn $300,000 or more, pay a minimum of 35 percent tax on their total income – around the top marginal rate for everyday Australians. The rule would only apply to these individuals if through tax deductions they managed to lower their effective tax rate below 35 per cent. There are sound reasons for some deductions and this rule would not prevent them. It merely places a limit, so that high income earners can't end up paying a lower tax rate than middle income earners. The rule is named after US billionaire Warren Buffett who was outraged to find his secretary paid a higher rate of tax than he did. So he proposed a minimum effective tax rate to stop the 1% making excessive use of deductions and loopholes. Click here to see the full policy report on the Buffett Rule, funded by GetUp members and prepared by The Australia Institute based on modelling by the National Centre for Social and Economic Modelling (NATSEM). Why should Australia introduce the Buffett Rule? Taxation loopholes have long been the domain of the wealthiest Australians due to the huge costs in hiring taxation experts who can play the cat and mouse game of chasing tax loopholes. According to the Australian Tax Office, 55 Australians who each earned over $1 million in 2012-13 reduced their taxable income to mean they paid no tax. The Buffett Rule would mean that the load is spread more evenly across all of us at a level that matches up with our income. It would also raise $2.5 billion a year in additional revenue, just by making the existing tax system more effective, which is more than the amount of the Abbott Government's proposed cuts to Newstart benefits and the age pension combined. How does this fit into GetUp's 'Brighter Budget' Campaign? The Government and the Labor opposition are looking for ways to save money in the Budget — so GetUp members are getting on the front foot to ensure these savings are fair and sustainable over the long-term. Instead of the austerity cuts that attack everyday Australians, we're campaigning for a Brighter Budget this time around. Reform negative gearing. Restrict tax concessions for negative gearing so they only apply to new housing stock. Australia is one of the few countries to allow negative-gearing losses to be offset against income – and no wonder given that fifty percent of this tax break goes to the top two percent of income earners. Reforming negative gearing will encourage investment in new housing stock, put downward pressure on rent and make housing more affordable. Reform superannuation tax concessions. Instead of giving all the tax breaks to those at the top, give the bigger concessions to those who need them most, and in the process ensure everyone can save for their retirement. Click here to sign the petition. Introduce the 'Buffett Rule'. Thanks to tax loopholes and high priced accountants, Kerry Packer famously reduced his effective tax rate so he paid less tax than his gardener. 'The Buffett Rule' would put a cap on loopholes for the top 1% of income-earners to ensure they pay at least the same tax rate as middle-income Australians. Click here to sign the petition. Scrap the capital gains tax discount. Concessions on capital gains tax predominantly benefit the wealthy, who have a larger proportion of their income from investments. Getting rid of the discount could save about $4 billion. Cut fossil fuel subsidies. Right now, the government hands over $11.5 billion a year in industry subsidies that incentivise pollution. We need to cut industry subsidies that aren't actually helping to create jobs and are just giving a hand out to multi-million dollar companies whose profits go overseas. Impose a super profits tax on banks. The big banks make inflated profits thanks to a lack of competition. A tax on those super profits would help compensate Australians for higher fees and charges. Introduce a 'Tobin Tax' on high frequency financial transactions. Big investment banks use powerful computers to trade in the financial market at huge volumes. This high frequency trading pushes up share prices for normal mum and dad investors. A tax of less than half a percent on these big investment banks' transactions would improve market stability and raise over $1 billion a year. Place a duty on wealthy estates. Place an inheritance tax on large estates. Will you send the infographic to your ALP MP or senator? 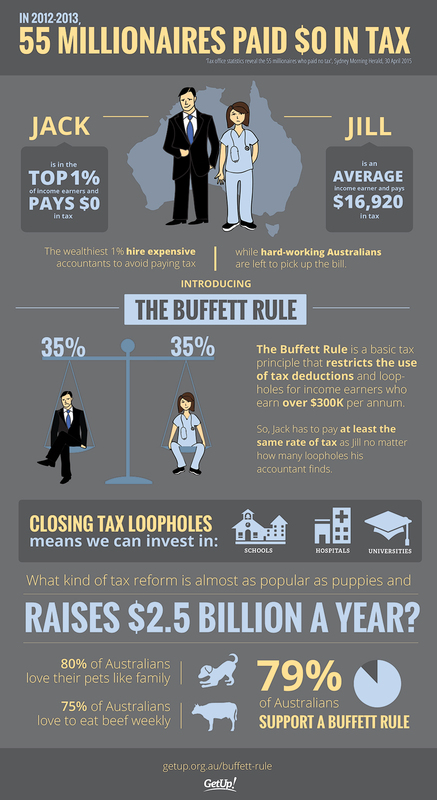 Together, we can get the Buffett Rule infographic into the hands of every Labor MP and senator in the country. Will you email your Labor MP or senator now?